Salmon fishing in Sooke has been hot and cold in the past few weeks, but appears to have heated up in the last couple of days. 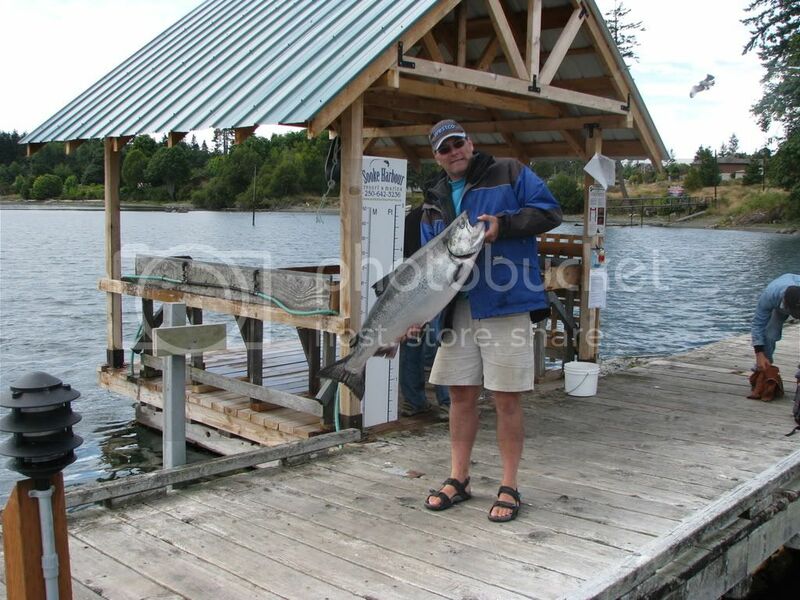 Reports are coming in of good bite times, with lots of fish being caught. Neil from Salty Towers reports plenty of action from Possession Point down to Muir Creek, pictured with a bunch of nice Springs caught with Mark Price and gang. Aug 5: Wolf: today saw a few fish caught, got mine down deeper today at 90 ft, the green/blue chrome head seems to be hot right now. Aug 9: Tips up: Had a good day today. 26lb, 21 lb and 19 lb. Lost 2 others on a double header. Good bite around 11:00. Aug 10: chris73: It probably doesn't get any better this year anymore in Sooke. And the weather cooperates now too. 4 salmon bites (countless dogfish), 3 hooked, 2 landed: 20# and 17#, trap between 70 and 85'. Aug 10: Luna: landed a 31,25, and 23# evening off Possession Point on a red hot spot and blue green chrome head, 6.5 ft leader at 78 ft.
Aug 11: abl: Trap shack was on fire this morning. 23#,28#, lost another. lots of fish being taken. water was like glass out there. Photos to the right courtesy of Blue Wolf Charters. 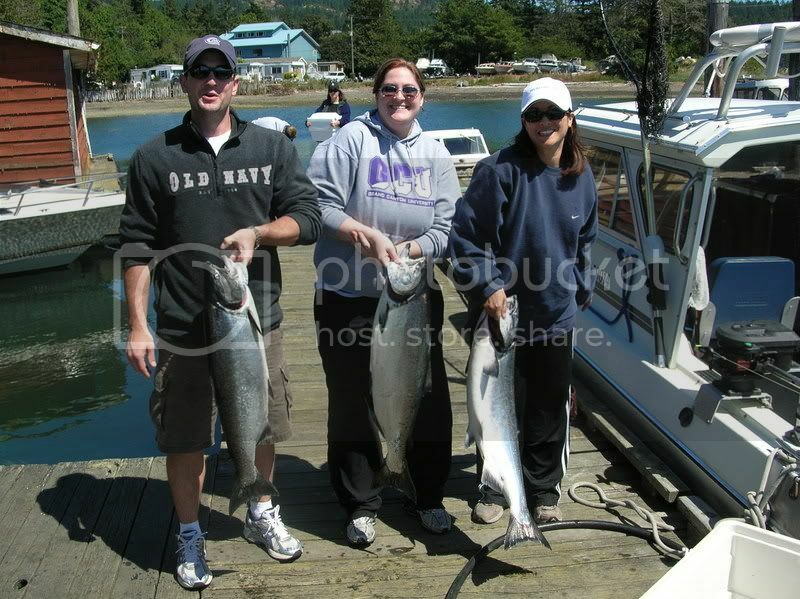 Folks at the Crab Shack report fishing this past Saturday was the best they’ve seen this year. Sunday saw another slowdown as whales were active. Wind has been another factor this past week. Tackle having good results: Rhys Davies lead - glow green, mint pearl (first thing in the morning), chrome army truck (later in the morning), betsy flashers - green, red or chartreuse Hot Spot flashers. Some Coyote spoons have worked well, too, and nickel/green - glo green/chart. Any half-pound weights have been rounded-up. Clarence Thomas 20 & 14; Garvin H. - 23; IWL Charters - 20; John S. - 24 & 22; John H. 18; Troy Smith - 27; Ed and Leyla Kustan - 21 & 23; Lorraine Lajeunessse 25 & 26; Phillip Andrews 25 & 16; Bob Waldhaus - 19 & 20; Chris and Mike Harris - 19 & 21; Ron Seacord - 26 & 15; Jimmy Chow - 23; Teague Griffin - 25 and Lorna Carswell - 17. 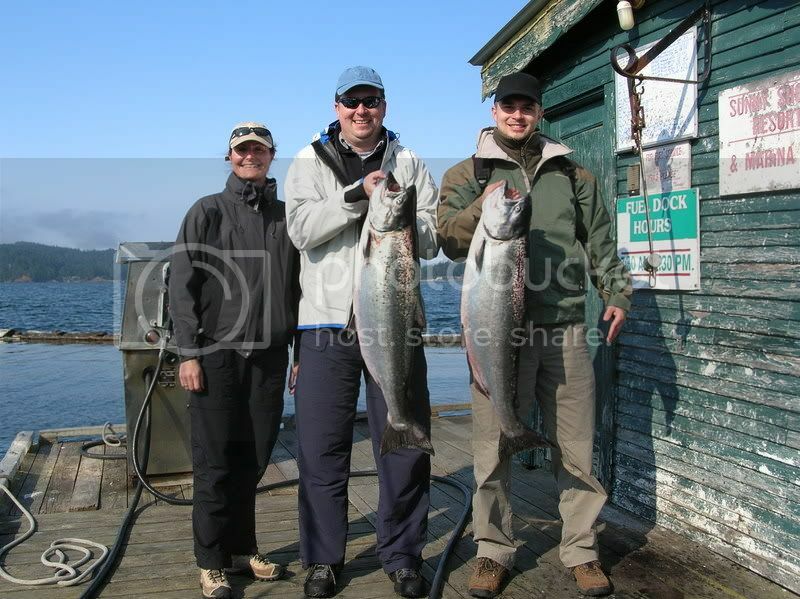 The week previous saw Brian Lacroix bring in salmon of 27 & 20 lbs. Luca Geib - 22; Art Foisy - 29; Bob and Luke Iles - 27 & 18; Dana Vowles - 25; Ben Westlake - 10; Alex Harris - 23; Nico Salvati - 26; Cal and Rodney - 16 & 18; Jim Cairns and Shawn Danyluk - a pair of 30s; Lewis Schile - 27; Edward Wormald - 20; Bill Mohro - 30; John Kruyer - 17; Kari Lindroos - 30; Nick Vuljak - 17; S. Carswell and John Kruyer - 29, 15, 28x2, 27, 20x2, 16; Rob Robinson - 18. If there's any best time of the year, this is it....time to get out there!